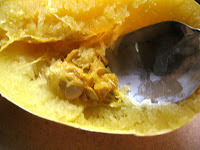 If you have never cooked up a spaghetti squash, either because you're not sure what it is, or how to cook it, or even how to eat it, let me introduce you to it. I'll give you several easy methods for cooking it up, so you can pick one that suits you best. 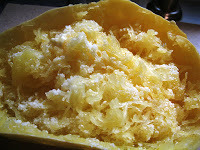 FoodSubs.com defines spaghetti squash like this: "After it's cooked, you can dig a fork into the flesh of a spaghetti squash and pull out long yellow strands that resemble spaghetti. Though they taste like squash, the "noodles" can serve as a low-calorie substitute for pasta." 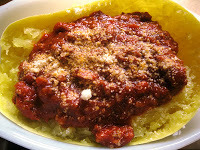 I've been substituting spaghetti squash for pasta ever since my husband became a type 1 diabetic early in our marriage. It's a nice alternative to pasta, and I rotate it in every few times that I cook up spaghetti. Of course there are lots of other ways to use it in recipes but the easiest one to start with is traditional spaghetti sauce. 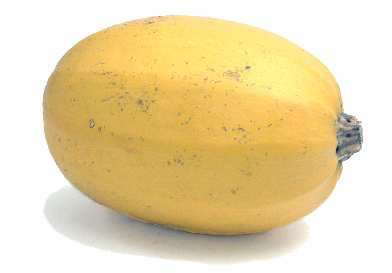 You can cook a spaghetti squash whole or in half. 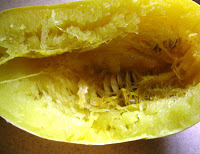 To cook it in half, the down side is, you have to cut through the tough rind with a good knife and cut it open length wise and scoop out the seeds (just like a pumpkin!) The only time I ever do this is if I feel like slow baking it seasoned with some olive oil and parmesan cheese. But usually I'm in too much of a hurry, so I usually cook it whole. The advantage to cooking it whole is that it is way easier to cut in half and scoop out the seeds. You can use every method for whole or half, except the slow cooker. It is better to only use a whole squash for this method. The disadvange to cooking it whole is that it does take just a few more minutes this way (but not much!) and you risk burns (if you are like me!) from not waiting for it to cool down just a bit before cutting and scooping seeds. Boil: 20-30 minutes till fork can pierce the skin. Bake: 375 degrees on a baking sheet. Whole: 1 hour. Half: 30-40 minutes. 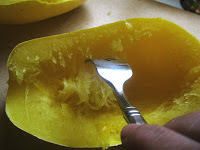 1) Using a skewer or knife puncture several holes in the whole squash (We don't want a squash expoding!). Microwave on high10-12 minutes for a whole one. 6-8 minutes for a half. 3) Here's what the inside looks like. There's actually not that much pulp/seeds to scoop. The sides show the strands of squash that are ready to be separated like spaghetti strands. 4) Scoop the seeds and pulp. 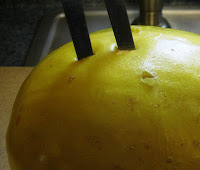 5) Using a fork, pull the strands away from the outer rind. Or top with your favorite sauce!